In 2012, the Guinness Book of World Records certified Sherlock Holmes “the most portrayed literary human character in film and television.” Note that human; the undead Count Dracula pipped Sir Arthur Conan Doyle’s detective at the post. Onscreen, Holmes has battled Nazis during World War II, stalked Jack the Ripper repeatedly, and been treated by Sigmund Freud. He’s been played for laughs and inspired a raft of imitators. (Paging Dr. House.) In this young century alone, Holmes iterations include two popular TV series updating his exploits to the modern day; the Robert Downey Jr. films positing him as a Victorian action hero; and an upcoming novel about Holmes’ equally adept brother Mycroft co-written by basketball legend Kareem Abdul-Jabbar. The Seattle International Film Festival recently presented the rare opportunity to see, mere days apart, two Holmes movies separated by one hundred years. In June, SIFF hosted the second American screening of the restored Sherlock Holmes (1916), long believed lost. 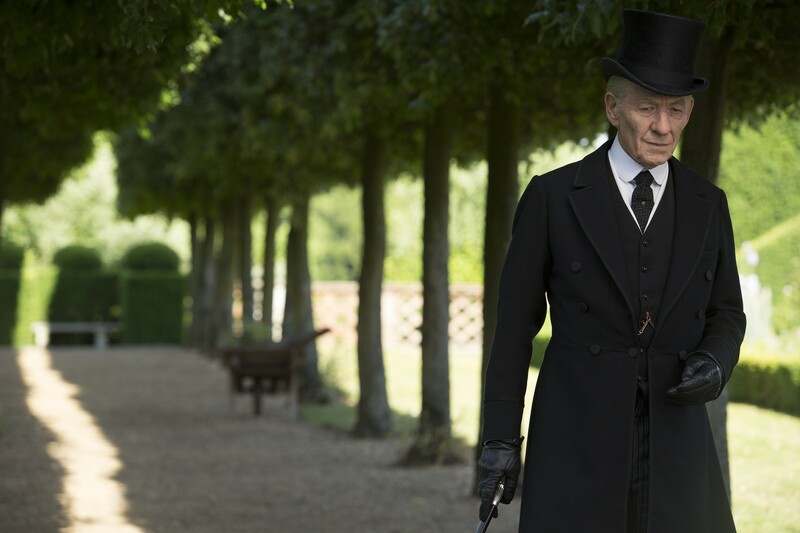 Coincidentally, the festival also showcased an early look at Mr. Holmes, in which Ian McKellen plays the sleuth as a 93-year-old squaring off with senescence as he strives to solve one final case. The new Holmes is old, the old Holmes is new; who could resist such symmetry? EatDrinkFilms contributor Thomas Gladysz covered the history of the 1916 Sherlock Holmes when it made its US debut at the San Francisco Silent Film Festival in May. 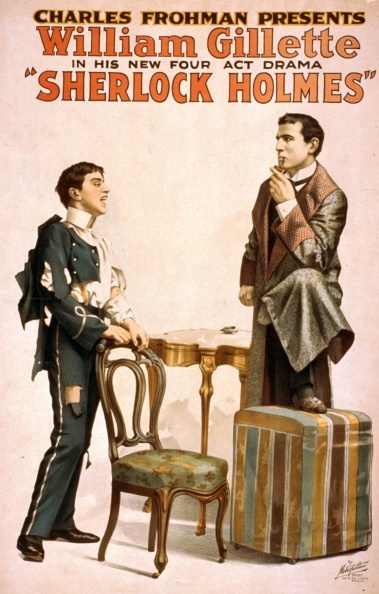 The film’s significance lies in preserving for posterity the performance of American actor and playwright William Gillette, whose revered interpretation of Sherlock Holmes—among his legion of admirers was Conan Doyle himself—would largely define the character. Little wonder Mark Gatiss and Steven Moffat, creators of the BBC’s Sherlock, helped to fund the restoration; they’re aware of the debt any actor who tackles the role owes to Gillette. 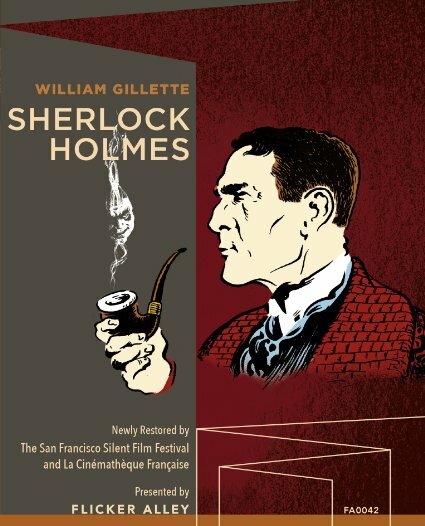 Poster for William Gillette in Sherlock Holmes. Credit: Universal History Archive/UIG via Getty Images. Alas, the movie proves to be a curio, of interest only to devout Sherlockians and silent film completists. Gillette’s warhorse of a play, cobbled together from several Conan Doyle originals, puts Holmes in the unappealing position of indirect agent of the crown, seeking to recover indiscreet letters written by a caddish prince to a young woman who committed suicide. The dead girl’s sister, Alice Faulkner, refuses to surrender the correspondence, drawing the attention of multiple bounders including the Napoleon of Crime, Professor James Moriarty. The restoration is based on a negative discovered in France, where the film was broken into a multi-part serial; it would work better in that format than as a two-hour feature. The plot advances in ungainly fashion, with Holmes making baffling decisions that place Alice in greater jeopardy, and key events—like a blaze destroying Holmes’ landmark residence at 221B Baker Street—are relayed via title card. The less said about the half-baked love story, the better. Gillette’s play was filmed again six years later with John Barrymore in the lead, and improves the storytelling in every way. It even clocks in with a shorter running time while finding room for a Marvel Comics-style prologue that explains the origins of the Holmes/Moriarty rivalry. There’s still an unconvincing romance, though, and both 1916 and 1922 films stress razzle-dazzle at the expense of ratiocination, rendering Holmes and Moriarty pulp characters with secret lairs and armies of operatives. 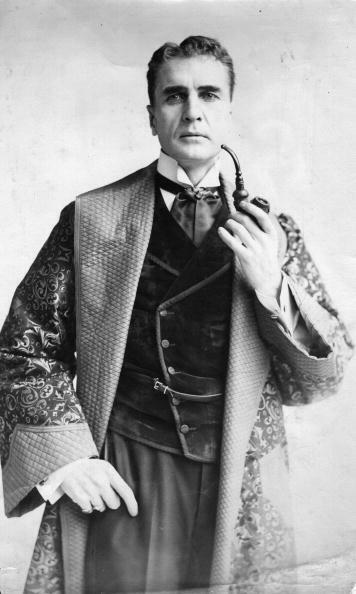 William Gillette in the first stage production of Sherlock Holmes, circa 1905. Credit: Hutton Archive/Getty Images. The burden of living with the public image of “the great Sherlock Holmes” weighs on the detective in Condon’s film. Roger regularly badgers Holmes to “do the thing,” instantly deducing details of a person’s life upon meeting them. Ironically, the one time Holmes relents he reveals information the lad doesn’t want to hear. 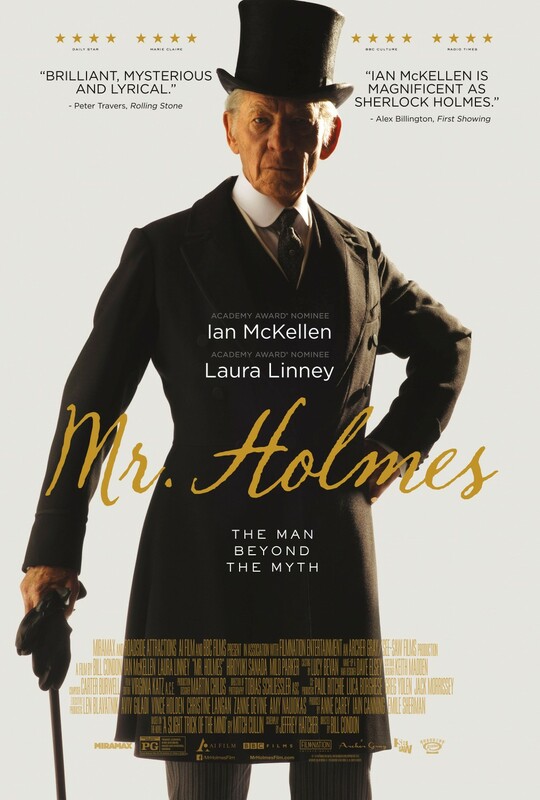 In Mr. Holmes’s most beguiling sequence, McKellen slips into a theater to watch the film based on Dr. Watson’s flawed report of the very case the aged Holmes seeks to unravel. Condon intensifies the hall of mirrors effect by casting Nicholas Rowe, star of the 1985 film Young Sherlock Holmes, as the detective in the film within the film: one Sherlock studying a second assaying a third. 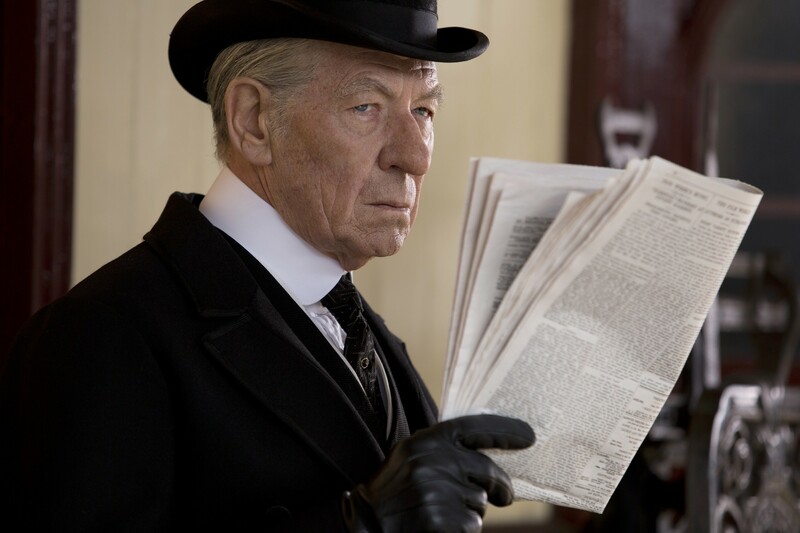 The exasperation McKellen’s Holmes feels toward the inaccuracies and embellishments in Watson’s stories emphasizes the good doctor’s absence from Mr. Holmes; the character has died by this point in Holmes’ life and appears only fleetingly in flashbacks. On that front the 2015 film is similar to the 1916 one, where Watson is an afterthought. Early on, Gillette instructs him to sit and read while he goes out investigating, and Watson cheerfully obliges. Considering the peppery dynamic between the characters as played by Benedict Cumberbatch and Martin Freeman in the BBC series accounts for much of its popularity, seeing Holmes without his companion twice in short order was doubly strange. At least Watson is missed in Mr. Holmes. He is but one of Sherlock’s ghosts, as the man losing his fearsome intellect is forced to feel answers with his heart rather than puzzle them out with his mind. The power of Condon’s film lies in the way it strips away attributes more essential to the character than a hat or pipe could ever be. His closest relationship, his keen observational skill, his memories—all are taken from him as they will, if we are lucky, be taken from us. That process humanizes an icon in a way no clumsy romance ever could. The final image of McKellen’s Holmes is shocking in that it is at wholly at odds with the conception of Conan Doyle’s detective as he has existed onscreen for a hundred years dating back to William Gillette, yet all of a piece with the tale being told. Opens July 17, 2015 in theaters nationwide. mrholmesfilm.com. Released on DVD and Blu-ray by Flicker Alley on October 20, 2015. This entry was posted in Columnists, Films and tagged Films, Sherlock Holmes, Vince Keenan. Bookmark the permalink.